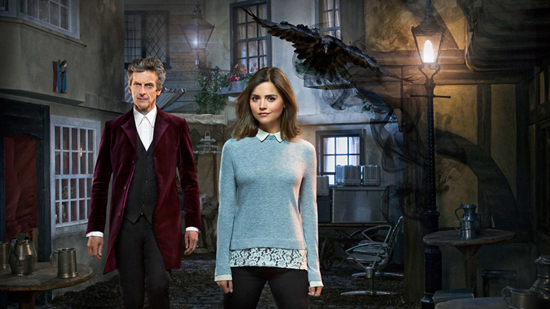 Series 9's three-part finale begins with Sarah Dollard's "Face the Raven", which reminded me a great deal of Harry Potter's Diagon Alley with its depiction of so-called 'trap streets'—places hidden from ordinary sight, shielded from perception, populated by alien refugees. The Doctor (Peter Capaldi) and Clara (Jenna Coleman) found themselves drawn into one, after responding to an emergency call by their mutual friend Rigsy (Joivan Wade) from last year's "Flatline". Rigsy's suffering from short-term amnesia and has found a tattoo of a three-digit number on the back of his neck (shades of Blindspot), which is bizarrely counting down to zero. Can The Doctor and Clara solve the mystery of Rigsy's missing time and find the reason for his body ink, before it's too late? There was a lot of imaginative ideas crammed into this hour, which I was pleased about. My favourite Doctor Who episodes are the ones that are more magical than sci-fi, and Dollard's script was a good example of that—even if it felt very indebted to J.K Rowling. The concept behind the story was great and it was good to see Rigsy again (although he was a bit wasted in his second Who appearance), but I wasn't entirely convinced by the rationale behind Ashildr (Maisie Williams) being involved in this adventure—soon revealed as "Mayor Me" of the trap street, who's brokered peace in exchange for the capture of The Doctor for unseen superiors. It feels like the show doesn't really know what to do with Ashildr—as her introduction felt like she was going to become a suitable companion for The Doctor, only to then announce herself as a sort of self-appointed guardian angel for those he puts in danger. Her return in this episode gave the story a bit of added zest because there's been groundwork to her appearance this year, but I didn't really engage with it. 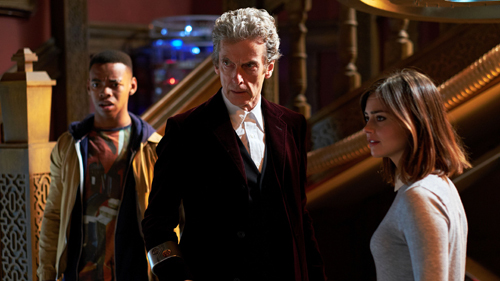 Regardless, "Face the Raven" was ultimately a good episode that could never really become its own thing because it was too much in service of the next few episodes—the aforementioned return of Ashildr, now becoming a more overt villain in The Doctor's eyes, and the need to end Clara Oswald's story. I dearly wish the BBC would keep such matters a secret, but we've known from the start that Coleman will be leaving Who, and even the possible surprise of her early exit was spoiled—by Capaldi himself in a few interviews, and some recent trailers I'm told. It's a pity. I'm sure the ending would have worked much better if I wasn't expecting it, but it still worked nicely thanks to a good performance from Coleman—whose farewell to The Doctor was very touching and mature. Capaldi was also good, even if his incarnation of The Doctor is too emotionally introverted to help give the farewell the wallop I wanted from it. It perhaps would have been wrong to find this particular Doctor blubbing (a la Tennant's), but wouldn't it also have been a lovely breakthrough moment—if part of his arc has been Clara helping him connect with people better? I don't know. Maybe I just wanted a really good cry here, and I felt a lump forming in my throat thanks to Coleman's dialogue, but the waterworks never came because Clara's emotion wasn't being mirrored by her Time Lord friend. And it suffered from a common issue of wanting to wring every drop of emotion from a scene that ended up dragging its heels as a result. I think I'd reached my emotional peak with the idea of Clara dying when she'd hugged The Doctor, so the actual moment where she walked out into the trap street to literally 'face the raven' felt a tad anticlimactic. Still, there are two episodes left and that's an exciting prospect. I like it when we're allowed to see the repercussions of big events like a major character's death, without having to wait months for the next series or a Christmas special. The Doctor has now been teleported to an unknown location by Ashildr (effectively exiled from Earth), and must deal with whatever awaits him without his trusted companion and with two broken hearts. Tough times ahead for our grieving Time Lord, no doubt. And being alone is bad news when it comes to the twelfth Doctor, with nobody around to keep him anchored and from making terrible lapses of judgement. Is this really the last we've seen of Clara, or Jenna Coleman specifically, on the show? Doctor Who Magazine has a cover photo of her in a 1950s U.S diner, so what's that all about? I'm guessing there's going to be another little appearance at some point, for some reason, rather like how Matt Smith made an unreported cameo in Capaldi's debut episode. 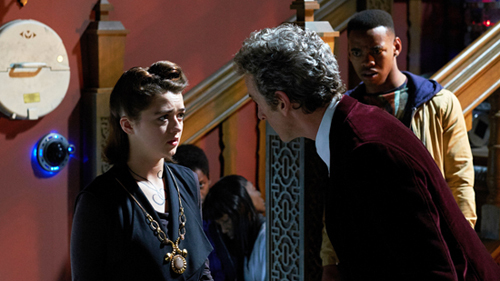 Any theories about who Ashildr's working for? Who would want The Doctor exiled somewhere scary? Pretty much every villain in the universe, but any prime suspects? Missy must surely rate highly, if the series is going to bookend itself with another appearance form her in league with the Daleks perhaps. Any thoughts on Ashildr? Will she be punished or killed before the series is over, or be kept around for a future appearance when Maisie Williams is available again?